I cannot accept TAKE A SNOOZE as legit. I guess it Googles up okay, but it just sounds so wrong to me. The verb is “snooze,” not “take a snooze,” people. Check out the synonymous phrases put forth in a 1965-1970 language survey at the Dictionary of American Regional English site, though. “Catch ten-twenty winks,” “ketch a wink,” “lay down and lose myself,” “crap out for a while,” and the inexplicable “going off for a minute in a chair” have all been attested. Overall, the fill’s quite smooth. 35a. [Like much sandpaper], TAN. Not sure I’ve seen that one before. 47d. [State capital on the Indian Ocean], PERTH. We don’t often get asked for state capitals outside the US. 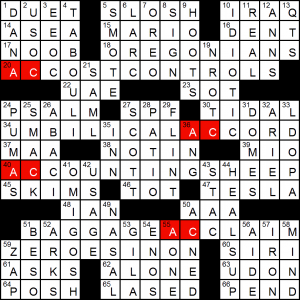 Today, Sam gives us a simple enough letter addition theme, where AC is added to four phrases. There’s no clever revealing answer to tie everything together, so the puzzle lives and dies by its entries. UMBILICALACCORD and ACCOUNTINGSHEEP are both winners, and ACCOSTCONTROLS and BAGGAGEACCLAIM are functional. Two hits is better than average as these puzzles go, I find. I’m not sure if it was eagerness to get TABOULI into the grid, but USOC/EEOC is quite a patch of alphabet soup, with ASEA running across it, and NOOB, which I imagine will trip up many older solvers. LARC is also a biggish clunk. There are four long across themers, and that generally translates to most of the rest of the puzzle being damage control. This entry was posted in Daily Puzzles and tagged Sam Trabucco, Samuel A. Donaldson. Bookmark the permalink. The 34A clue “John Hancock competitor” for AETNA is too clever by half, as Aetna is not a competitor of John Hancock in any meaningful sense. John Hancock is a life insurer and Aetna is a health insurer. There may be some very small overlap in products, but their core businesses are very different, and nobody in the industry would consider them competitors. There’s some interesting background and history to HELLA and related terminology at this Language Log post. The comments cover a lot of ground. As a long-time DC area resident, I can say that I never use the term myself and don’t recall ever hearing it used (also, I am 60 so don’t tend to know what the young kids these days are saying). 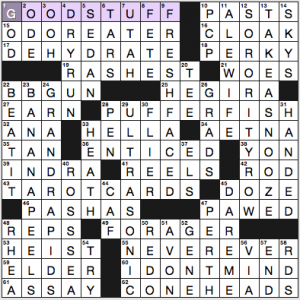 I liked the puzzle — I started off in the NW and breezed along on a generally SE heading, but slowed down in the SE corner. I guessed PATNA for PERTH, but then I tried NEVEREVER and the rest fell. NYT: Beautiful, beautiful grid. Lots of fun from start to finish. But I agree about TAKE A SNOOZE, especially since, with only CLOAK and PUFFERFISH in place, I confidently plopped in CATCH SOME ZS, and it fit! If I had had DOZE in place, I would’ve been even more perplexed! Wonderful puzzle! ; Sam hit a home run with his first NYTimes themeless. Perhaps it’s only in common usage among New Englanders but, “I’m going to TAKE A SNOOZE”, is often heard from those heading for an afternoon nap.